Billed as “the fishing journey of a lifetime,” this is a meaty, large format coffee-table tome, riotously illustrated in colour by Peter and Beverly Pickford. In two hundred and some pages, the author globe trots from Alaska, to the Bahamas and Argentina; taking in Ireland, Scotland, Botswana, South Africa, Bhutan and New Zealand in on the way. Apart from Bhutan, this is pretty much staple fare, although I suspect that the Southern African destinations will be new to many American readers. 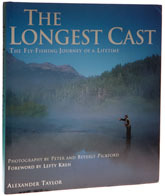 Each chapter is organised to give a flavour of what the fishing will be like, with a scene setting essay, advice on tackle, conservation issues; and, right at the back of the book, places to stay and other contacts. If the book has a fault it is that it sticks to absolutely standard destinations while trying to cover too much ground. The text has a tendency to dissolve into mush, with sentences like, “Somewhere, out on the horizon, where whales meet and salmon are learning to grow, two small fish in the sea will find each other under the same moonlit night, and marvel that life is so beautiful.” On the other hand, the photography is fantastic, even if the Pickfords managed to take several photographs of Ireland’s Drowes river without revealing the fourteen miles of boardwalk for which it is renowned among the leagues of bubble-floaters that patrol its banks. This must have taken some doing, I can tell you - I am not exaggerating. I’m not certain who this one is aimed at, and beautiful though it is, I would watch out for it should it get remaindered.